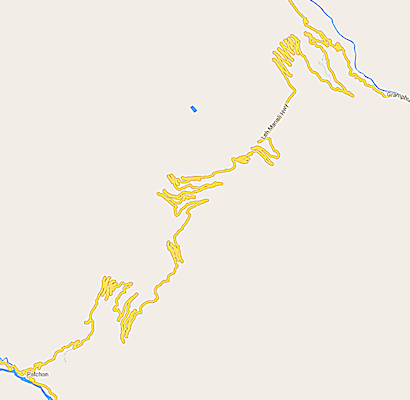 The mountains grew steeper and the rivers more wild as travelled deeper into the Himalayas. Many of the roads were cut into the sides of deep gorges with the occasional stone block to remind you not drive over the edge. Afer many stops to stretch our legs and get a nice sip of Chi we arrived a Tabo a mere 12 hours later. After a good nights rest and a quick walk around the town we headed off to our next destination of Kaza. Here we filled up with petrol at what was claimed to be the highest retail outlet in the world. A overnight stop was made here and the next day we climbed higher to visit a temple at an altitude of 4513m. The head monk made us tea. He was the only one there; the others were apparently away on holiday! 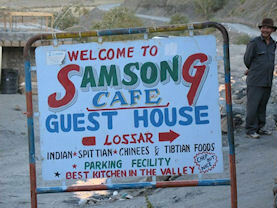 Then onwards from here to overnight at the small village of Losar. The food included local Mu-mu's (a sort of pastry parcel) with a very hot chilli sauce. We told one of the guys it was mint sauce; the result was interesting! From here we trvalled over the highest point of our journey; the Kunzum Pass, at 4590m. After a quick stop to view the shrine we carried on down the Spiti valley. Eventually we left the valley over the Rohtang Pass to descend almost 4000m to the twon of Manali. The change in senery was dramatic. At the top, high altitude desert; at the bottom, alpine style pine forests. The road seemed to consist a never ending series of sepentine loops down the side of the mountain. Manali is a small town, though by the standards of the last week or so it was large and bustling. It has become very popular with Indians as a tourist destination. We spent two nights here sleeping in the luxury of a hotel! After some site-seeing and a bit of shopping (I picked up a singing bowl, an awesome mask and a traditional hat) we headed of down the fertile valleys towards our final stopover in Shoja up in the hills amongst the pine forests. After a fine meal we sat around the campfire sipping our bottles of Kingfisher or Old Monk rum as the sun went down. The next day we rode the final leg of our journey back to Shimla, eventually re-crossing our outward path. A stop overnight in Shimla and then we were back on the narrow guage railway to Kalka. Arriving at Kalka after sunset we transferred to an over-night sleeper to take us to Delhi. Our original contact met us again at the station and transported us back to the airport for our flight home. An absolutely awesome trip. I want to go again please! Check out the photos and videos.